Michael Swearngin’s interest in the American Cowboy began at a young age. Michael was born in Olathe, Kansas in 1959 and in his youth his grandfather taught him the heritage of the cattleman and rancher. Michael’s family moved overseas for six years where his father and mother traveled throughout Europe. There his interest in painting began. Moving to San Antonio, Texas in 1973, Michael began his art career. Spending sixteen years there influenced him to develop the rich colors and textures in his contemporary style of painting. Michael now resides in Scottsdale Arizona. 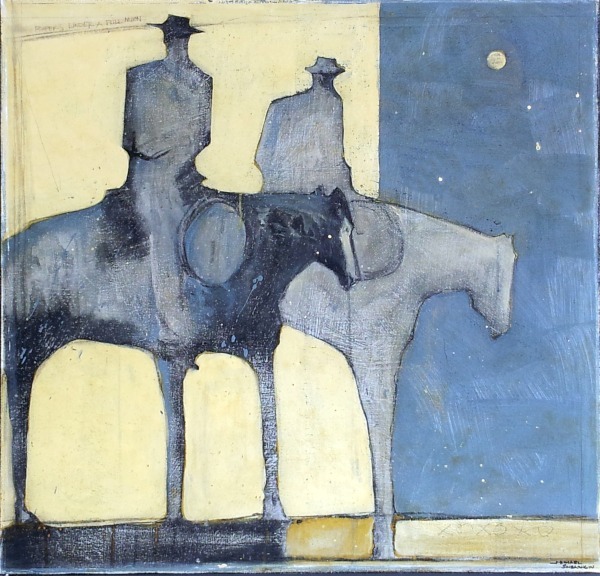 Combining his interest in contemporary art with the fading heritage of the American Cowboy, he expresses these experiences to others through his art. Michael’s fluid acrylic paintings create unique imagery inspired by the rugged spirit so vividly seen in the west. Michael gives thanks to God for his many gifts and faith; to the cowboys, friends, and family – especially his grandfather, Lowell, and father, Charles Swearngin. They have supported his art career and taught him to keep the heritage of the West alive through his Contemporary cowboy paintings.